My favorite Passover snack and meal isn’t a fancy roast or laborious dinner… Instead, it’s this 4-ingredient matzah pizza that you can make in your oven, or even toaster oven. It satisfies all the cravings I’m having for those foods we’re not allowed to eat this week! 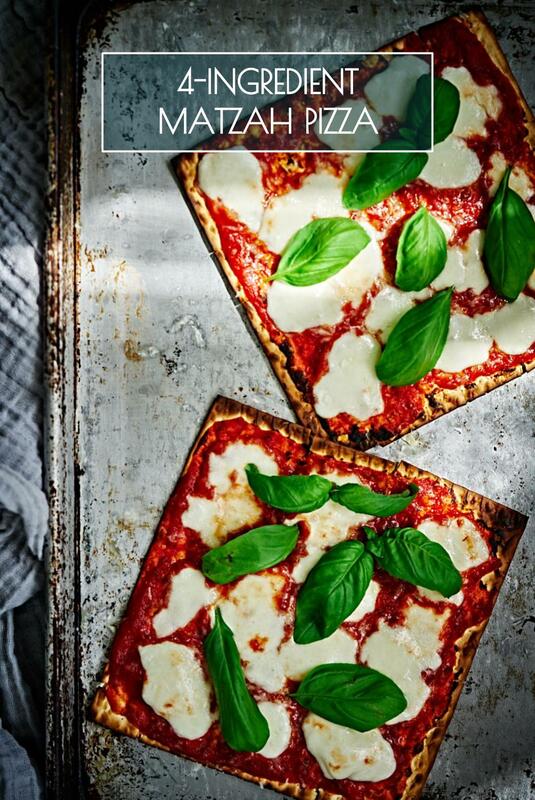 This 4-ingredient matzah pizza is my favorite Passover snack and meal. Easily made in your oven, or even toaster oven. Plus, my kosher for passover list! Place your matzah on a baking sheet (or two). Spread 1/4 cup of sauce on each of your matzah. Shred 3 oz. of mozzarella over each of your matzah. With the oven rack just below the broiler, broil on high until the cheese melts, ~5 minutes. Keep your eyes on it so the matzah doesn’t burn. Remove from oven, top with fresh basil, and let cool slightly before eating! Looking for kosher for Passover pizza sauce? If you can’t find it in your grocery store, it’s available on Amazon! Click here to shop. Looking for more of my kosher for Passover dishes other than this matzah pizza?